In a region noted for its rich baseball history, one of the Philadelphia area’s most precious treasures was surely a man named Whitey Witt, a big leaguer whose career began with the Philadelphia Athletics in 1916. The quiet country street that bears his name provides the only conspicuous testimony to Witt’s his former presence there. He lived peacefully and without celebration deep in the farmlands of South Jersey. His was not a household name in baseball circles, but if you looked it up, you would find that Whitey Witt had an excellent career that was as fascinating as it was remarkable. Regarded as one of the finest leadoff batters and fastest men of his era, the 5-foot-7-inch, 155-pound center fielder was an outstanding hitter and bunter, and the owner of one of the game’s best batting eyes. He was also an excellent fielder, one of the best of his era. In ten years in the major leagues, Witt had a lifetime batting average of .287 with 1,195 hits in 1,139 games. Never a power hitter, Whitey hit a career total of 18 home runs with 302 RBI. He had 144 doubles, 62 triples, 489 walks, and 78 stolen bases. In a five-year stretch between 1920 and 1924, the left-handed-hitting Witt piled up successive batting averages of .321, .315, .297, .314, and .297. The numbers, however, tell only part of the story. Witt, who played for the Athletics in the lean period between the club’s championship eras, was the first New York Yankee to bat in Yankee Stadium. He was one of Babe Ruth’s best friends, and was one of the few players who could hit the offerings of Walter Johnson. In fact, Witt had a career built around Hall of Famers. He played for Connie Mack and Miller Huggins, roomed with Nap Lajoie and Zack Wheat, was there when Lou Gehrig broke in, and was good friends with Ty Cobb, Mickey Cochrane, and Goose Goslin. When Witt talked about this group, he did so with relish, lacing his recollections with anecdotes that made it seem as though they just happened. Despite his years, when I interviewed him in 1984 the then-88-year-old codger was remarkably spry, as evidenced by his fondness for golf, a sport he played as often as three times a week with local friends and ex-players. At that point, it was nearly 60 years since Whitey had pulled on a big-league uniform. But the charm and color of his era were still evident in his conversation. While playing with the A’s, Yankees, and Brooklyn Robins from 1916 until 1926, Witt appeared in what is often considered to be the golden era of sports. Whitey was born on September 28, 1895, in Orange, a small town in central Massachusetts. His name was Ladislaw Waldemar Wittkowski. In his late teen years, he attended what was then called Goddard School, where he was not only noted for his baseball exploits, but was also a track star. Witt came to Philadelphia as a shy, 19-year-old shortstop with no minor-league experience. “I went right from high school to the A’s,” he said proudly. “I was going to boarding school in Barre, Vermont, and playing in the White Mountain League. That was a summer league with teams sponsored by the big resort hotels in New Hampshire and Vermont. Most of the teams were made up of college boys from schools like Harvard, Yale, and Dartmouth. They had summer jobs at the hotels. “I was hitting over .400 while playing for St. Johnsbury,” Witt continued. “A scout was following me. One day I got a telegram from Connie Mack asking me to meet him in Boston. Witt reported to the A’s the following season, and soon found himself the team’s regular shortstop. His second-base partner was Lajoie. “He was the most graceful infielder I ever saw,” Witt said. “His career was pretty much done by the time I got there, but he helped me an awful lot. He took me under his wing. None of the others helped me, but he sure did. In his rookie season, Witt led the American League shortstops in errors with the unfathomable total of 78. The A’s finished last, a feat they duplicated every season from 1915 through 1921. “We had some pretty good players back then,” Witt said. “Guys like Stuffy McInnis and Joe Dugan, my roommate later on. We had Rube Oldring in left, Wally Schang was the catcher, and we had Joe Bush pitching. But it was hard playing on those teams. You’re losing all the time. It was no fun. When I got to the Yankees, it was so much different. We were always up in the race, and it was easy to play ball. Playing mostly at shortstop but occasionally at third base and in the outfield, Witt hit .245 his first year and .252 in his second season. Before he got to play his third year, though, he was drafted for World War I. Although he played briefly at second base in 1919, Witt wound up in left, then moved to right one year later. He lifted his average to .267 the first year back from the Army, then put together two strong seasons of .321 and .315. He had career highs in hits (198) and at-bats (629) in 1921. “Now, that was after I’d played all those years for him. That really got under my skin. I took the raise, but I wasn’t too happy. Mack sold Witt to the Yankees for a reported $15,000, a huge sum in those days. “I didn’t want to leave the A’s,” Whitey said. “I had hit good for them, and I had the farm in South Jersey. I had three or four thousand dollars in the bank. But it turned out pretty good, going from a tail-ender right into the World Series with Babe Ruth and that bunch. “I didn’t report to the Yankees right away,” Witt added. “I got there three or four days after the season had opened. They said, “Where the hell have you been?’ I told them I had taken a little vacation. I had gone to Atlantic City. Witt was installed as the Yankees’ center fielder and leadoff batter. After Ruth and Meusel returned from their six-week suspension, Whitey became the anchorman, playing between the two lumbering sluggers. Later, he would say that racing back and forth between those two in every game wore him out and shortened his career. Witt ended his first season with the Yankees with bandages on his head but a smile on his face. He had led the American League in walks with 89 while hitting .297 and scoring 98 runs. “Right at the end of the season, we went into St. Louis for a three-game series with the Browns. We were both fighting for the pennant, so there was a big crowd, and they had the field roped off. In the first game, I was going after a fly ball and somebody threw a Coca-Cola bottle that hit me in the head. Knocked me out, and they had to carry me off the field bleeding on a stretcher. It was a really nasty crowd, and after I got hit, a riot almost broke out. After winning the pennant by one game, the Yankees lost in the World Series for the second straight year to the New York Giants, this time getting swept in a five-game Series (one was a tie). Witt hit just .222 for the Series. The following year, though, the club’s luck changed. It all began in the season opener when on April 18, 1923, the gates were opened to a brand-new Yankee Stadium. Some 74,000 fans, well above the seating capacity of 58,000, jammed into the ballpark. Thousands of others stood outside in the surrounding streets. World-famous conductor John Philip Sousa and his Seventh Regiment Band were featured in the pregame festivities, and Governor Al Smith threw out the first ball. Witt was not through making history. In the third inning, he was walked by Boston pitcher Howard Ehmke with two outs. After an RBI single by Dugan, Ruth stepped to the plate. Before the game Ruth had told a writer, “I’d give a year of my life if I can hit a home run in the first game in this new park. Ruth got his wish when he ripped an Ehmke pitch into the stands in deep right field. Witt came home, thus becoming the first Yankee to score on a Ruth home run at the new ballpark. The Yankees went on to win the game, 4-1, with Whitey ending with a single and a walk in three official trips to the plate. Shawkey got the win with a three-hitter. From there, with Whitey hitting .314, scoring 113 runs, and hitting a career-high six home runs, the Yankees went on to win the pennant and capture their first world championship. In the World Series, they beat the Giants in six games. Witt’s two doubles, a single, and a sacrifice fly accounted for two RBIs in the fourth game, won by the Yankees, 8-4. Whitey finished the Series with a .240 batting average. Ruth was the same age as Witt. The two became inseparable friends on and off the field, and even roomed together for a while – or at least they stayed in separate rooms in the same suite, an experience about which Witt had countless stories. 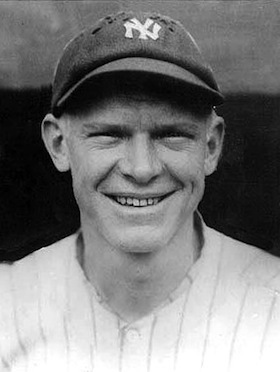 Teammates sometimes called Witt “Babe’s errand boy.” Ruth called Whitey “Laddie Boy.” “Get on your bike, Laddie Boy,” Ruth would yell when a ball was hit toward him in right field. Once Whitey and the Babe were even fined by Yankees owner Jake Ruppert after the two were found drinking heavily in an illegal brewery in Chicago during Prohibition. Ruth was fined $5,000 and Witt was hit with a $500 fine. When the Bambino died in 1948, Witt stood by his casket at the viewing at Yankee Stadium for five hours. “Babe Ruth always considered me one of his best friends,” Witt said. “I loved the guy. There was a lot of jealously on our club. Some guys were always knocking Ruth, calling him a big bum and so forth. Wally Pipp was one of them. Once, they had a hell of a fight. I always said to those guys, ‘Why do you knock him? He’s our meal ticket.’ We would have been nowhere without him. “Ruth hit the ball better than anybody. And he was a hell of a nice guy. He loved kids, he loved to visit hospitals, he loved the women. He always had a big bankroll with him. He never drank as much as people said he did. But he ate a lot. In my book. there were two great ballplayers in my day – Ruth and Ty Cobb. They were two of the greatest of all time. Ruth had color. Cobb was spectacular. Everything he did was spectacular. “I’ll never forget, when I played shortstop for the A’s and Cobb would be on second. After every pitch, he’d run about halfway to third, and dare the catcher to throw the ball. If he threw it back to second, Cobb would be on third. In Witt’s last year with the Yankees, the club had a rookie first baseman named Lou Gehrig. Whitey had vivid memories of the young slugger. “To me,” Witt said in a moment of slight exaggeration, “Gehrig was more valuable to the ballclub than Ruth because he was very consistent. He seldom struck out, and he could drive in runs. He always had the bat on the ball. Witt said that the best pitcher he ever came up against was Hubert “Dutch” Leonard, the Boston Red Sox and Detroit Tigers left-hander. “I always figured he was going to hit me right in the ribs,” Whitey said. “He was a sarcastic guy, too. I never liked batting against him. “Now, Walter Johnson, if you look back, you’ll find I hit very good against him. He had a speedball that would knock the bat right out of your hands. But I was a punch hitter. I could get the bat around on him. I bet I hit .400 against him. (Actually, Witt went 28-for-90 against the Big Train, a .311 batting average.) In fact, Connie Mack used to say, ‘Today, we’re playing Walter Johnson. I want you boys to watch how Whitey hits against him.’ Johnson didn’t have a good curve. It wouldn’t break much. But he had one of the greatest arms God ever put on a man. His speedball came up, and it looked like a golf ball coming at you. If he hit you, he’d have killed you. “One time we were down in Washington, and both clubs – the Senators and Yankees – were leaving town at the same time. I went down to the railroad station, and I’m walking along the platform. Both clubs were in the dining car getting ready to eat dinner. A window was open, and who’s sitting there, but Johnson. He hollered out, ‘Hey, Whitey, Come here. I want to talk to you.’ So, I go in and have dinner with him. One pitcher whom Witt hit with spectacular results was Ehmke. In 1923 Ehmke pitched a no-hitter against the Athletics. In his next outing, he had another no-hitter going in the last innings against the Yankees. Witt ended Ehmke’s bid for a double no-hitter when he bounced a single off the third baseman’s chest. The ball then hit the Yankee third-base coach, and Witt beat it out for a hit. Witt hit .259 in one year as a reserve outfielder in Brooklyn. After playing in his last game on August 18, 1926, and getting released at the end of the season, he dropped down to the minor leagues, a level at which he had never played before. Witt spent three years in the minors, playing one season each with the (San Francisco) Mission Reds, the Kansas City Blues, and the Reading (Pennsylvania) Keystones. At the end of the 1929 season he retired from professional baseball and returned for good to his home in South Jersey. After his retirement from baseball and until 1971, Witt owned and operated a tavern called Whitey’s Irish Bar on Main Street in Woodstown, New Jersey. Ex-players and fans flocked to the bar nightly to hear the friendly and gracious Witt tell stories about his playing days. For a while he also managed and played for a semipro team in the area while palling around with his neighbor, former Washington and Detroit great and future Hall of Famer Leon “Goose” Goslin. Eventually Witt, whose wife, Mary McClain, died in 1962 – the couple had no children – sold the bar. For many years thereafter, he spent his winters in Florida and his summers in South Jersey, where into his early 90s he played golf three times a week and drove himself twice a week to a race track across the bridge in Delaware. Whitey was also a regular participant in old timer’s games at Yankee Stadium, and was a featured guest at the ballpark’s 25th-anniversary celebration in 1948. This biography is based on the chapter “A Rich Career Among the Greats” from the author’s book Diamond Greats – Profiles and Interviews with 65 of Baseball’s History Makers (Westport, Connecticut: Meckler Books, 1988). Statistics were verified by baseball-almanac.com.